Splash screen; Select image from camera/gallery; Crop image; Delete unwanted background with your finger scratch; Give effect to your image like opacity, brightness, contrast; Adjust your image with zoom in ,zoom out and rotate in any direction with 2 fingures. Select background from lot of attractive background. 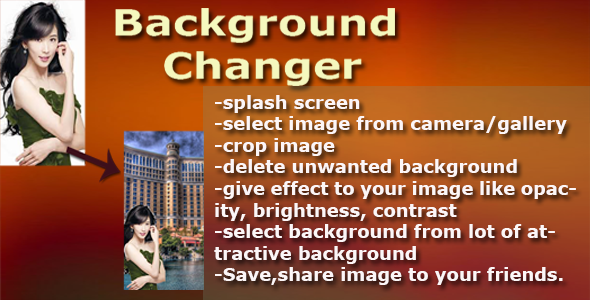 0 Response to "Photo Background Changer v1.0 - CodeCanyon"